Welcome To Liquid Granite Company, LLC! 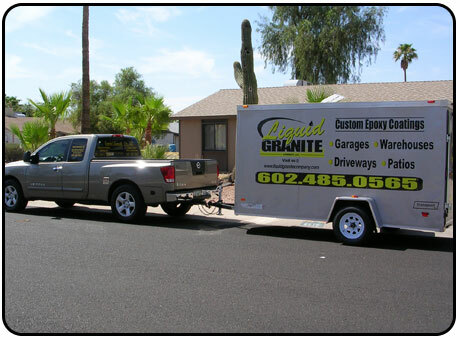 Liquid Granite Company, LLC: A family owned and operated Arizona company creates and installs unique Epoxy/Urethane coatings & Acid Staining that enhance the appeal and value of any home. Your old deteriorating, stained garage floor can be brought back to life at a very reasonable cost. Many home builders now offer the beauty of a shiny garage floor as an upgrade. Our coating installers are the best in the business.You will be amazed at how tough the coating is and how easy it is to clean. Oil drops will wipe right away. To provide the finest quality Epoxy & Urethane Coating systems backed by the best service to the most demanding & quality - minded homeowners & businesses in our areas of operation.